Always remember that when shooting a production, terrible sound is the most unforgivable offense there is. Shooting a scene that is a bit too dark or a scene that may be too blurry because of all the action is usually forgivable, especially if the content is good, but shoot a scene where the audio is terrible and your audience can’t understand, and they will walk out on you. From home movies to million dollar productions, sound is a key component in allowing your production to be as professional as possible. Poor quality audio is a dead giveaway of an amateur production. Even George Lucas can be quoted as saying “sound is fifty percent of the movie-going experience.” In order for you to understand how to get the best possible audio for your production, we have assembled a few tips and techniques for you to look at. Keep these in mind on your next production shoot. The main downfall of using the built-in mic is that if you have to shoot outside, you are going to have an extremely difficult time not picking up other background sounds. These are the most popular microphones for location interviews. Both sporting events and news and information programs will use a traditional handheld ‘stick’ mic for field interviews. These microphones come in both a wired and wireless set-up. Although a wireless microphone is always more convenient for the person using it, the sound engineer must always be aware of the possibility of RF (radio frequency) interference. The proper positioning of the microphone from the face is important. Too close will result in popping P’s and possible distortion and a mic that is too far from the face will result in too much ambient noise getting into the recording. Spend time doing audio checks to learn the best microphone placement. Lavalier microphones are commonly used in studio news and information format programs. A big benefit with these mics is that they are very small and unobtrusive to the viewer while still giving great sound quality in a controlled environment. 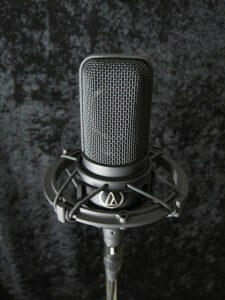 When working with a lav mic, experiment adjusting the mic placement on the subject to allow for optimum sound quality. Lavalier microphones are also available in both wired and wireless setups. This is in fact the “go-to” microphone for most television shows, major movie productions and documentaries. This is also the more expensive way of recording sound since it involves an additional person – a Boom Operator. The trade-off is worth it however since there is no visible evidence of a microphone in the shot. An experienced Boom Operator who can work well with camera operators is an asset to any production. Always arm your microphones – no matter what setup you use, with windscreens. Windscreens not only protect you from raging wind sound, but they also help to cancel out other outside background noises that may be going on around the production. You can purchase windscreens for a reasonable amount, and they come in low-tech versions (hand held or lav mics) and high-tech versions (boom mics). The heavy-duty outdoor windscreen is called a zeppelin. These are beneficial to have on bigger shoots when using a boom mic setup. The shock mount helps isolate the microphone from the boom pole and will eliminate sounds from your hands and fingers while you hold the boom. Most boom mics come with this, but if not there are plenty of generic shock mounts you can purchase for a reasonable price. All of these types of mic setups – if used the proper way, will take your production to the next level, even if you are using low–end equipment. Remember – and I can’t state this enough, good quality audio is more than half of a good production.